gallina.) En Hiyoko a veces llega el útero completo; a veces, las puras protoyemas, cocidas al punto de una esfera temblorosa. Y ahí termina la clase de anatomía de aves. ¿Tomaron nota? Todo va a venir en el examen. It could be said that Hiyoko’s cooks know everything about chicken. Grilling chicken in a yakitori, Hiyoko style, is a matter of precision in time, of space –the placement of the pieces in certain coordinates of the grill–, and of charcoal –they use binchō-tan, white charcoal from Japan’s Wakayama prefecture–. It’s a matter of delicacy and control. 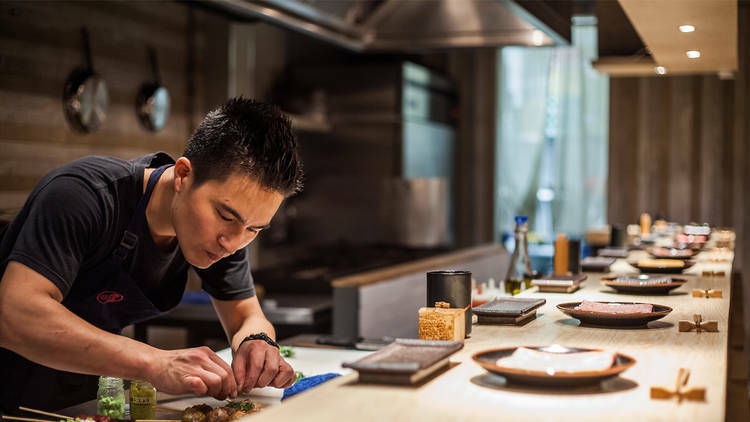 An omakase might include a wing which, when you bite it, it reveals a surprise filling of rice and plum; heart, or hatsu, still delicate in flavor and texture; a skewer made of neck skin (kawa) or sweetbread (sunamigo) or cartilage (nankotsu)… Each one is harder to bite, each one is more satisfying at the moment it finally gives in to the jaw’s pressure; a liver (reva) skewer has a flavor intensity proportionally inverse to its texture’s density. Afterwards: a bowl of rice and grinded chicken with ginger, a chicken sashimi with baby sprouts or maybe some tofu with chives; katsuobushi and soy sauce to revive the tongue and palate. At the end, if you’re lucky, a portion of wren: the hen’s uterus with proto-eggs. (Or eggcup, how this piece is called in hen broths). In Hiyoko you sometimes get the whole uterus; sometimes just the proto-yolks cooked to the point of a shaking sphere. And that’s the end of the class on bird anatomy. Did you take notes? Everything will be on the exam. 💰💰💰💰 Prices. The omakase depends on ‘the market price’, so it will vary from one time to the next. Calculate at least 1,500 pesos, a couple of wine glasses included.